Thanks for reading this issue of The ACW Story. This is our tenth issue, please enjoy! Have you heard of Robert Smalls? There is a good chance you haven't, so read on to learn more about his amazing story! "One of the most daring and heroic adventures since the war commenced..."
- Harper's Ferry June 14, 1862, article about Robert Smalls. In the early morning hours of May 13, 1862, Robert Smalls (a slave in Charleston, South Carolina) stole a Confederate gunboat, the Planter, and along with a crew of fellow slaves sailed it to freedom. "This, he saw, was about as good a chance as he would ever have to do so, and therefore he determined not to lose it. Consulting with the balance of the crew, Smalls found that they were willing to co-operate with him, although two of them afterwards concluded to remain behind. The design was hazardous in the extreme. The boat would have to pass beneath the guns of the forts in the harbor. Failure and detection would have been certain death. Fearful was the venture, but it was made. 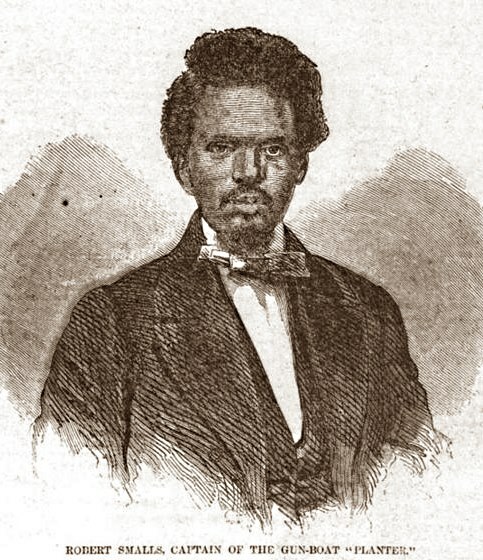 The daring resolution had been formed, and under command of Robert Smalls wood was taken aboard, steam was put on, and with her valuable cargo of guns and ammunition, intended for Fort Ripley, a new fortification just constructed in the harbor, about two o'clock in the morning the Planter silently moved off from her dock, steamed up to North Atlantic wharf, where Smalls's wile and two children, together with four other women and one other child, and also three men, were waiting to embark. All these were taken on board, and then, at 3.25 a. m., May 13, the Planter started on her perilous adventure, carrying nine men, five women, and three children." Read the rest of Robert Smalls's story by clicking here. What was Robert Smalls's wife's name?